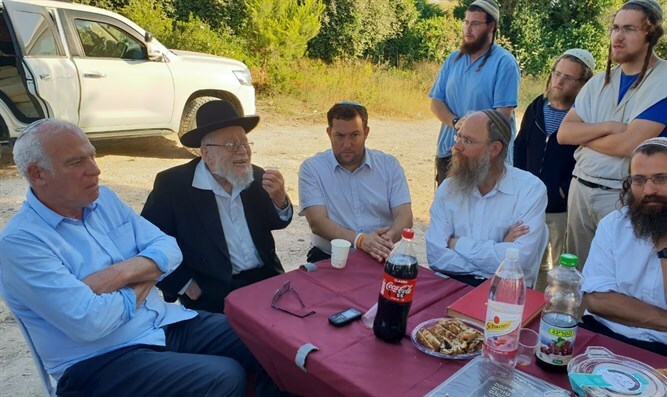 Agriculture Minister Uri Ariel visited students of the Homesh Yeshiva who study on the ruins of the village destroyed in 2005 as part of the disengagement plan. The Minister's visit is part of a broad campaign run by those expelled from Homesh and Sanur to pass a law to end the disengagement in northern Samaria, with the aim of returning home and correcting the injustice of the expulsion. Minister Ariel met with the students and told them, "We will remember and return, waiting eagerly for passage of the law by my colleague Shuli Mualem to cancel the disengagement law in northern Samaria so we'll finally be able to return home after 13 years. "You are the most pioneering group with the most significant values we have today in 2018. We continue to work so that we can return home," he said. "We salute and strengthen the hands of the yeshiva students and the head of the yeshiva, Rabbi Elishama Cohen. Homesh is an inseparable part of the settlements of the Shomron Regional Council, and we are sure the day is approaching when Homesh and Sanur are rebuilt. Most of the ministers support the return to Homesh and Sanur and in canceling the Disengagement Law, we expect this government to pass the bill and correct this terrible injustice." Rabbi Dov Lior, who also participated in the visit to the Homesh Yeshiva said, "I am very happy to see the bnei Torah here. If I were 18 years old I'd come here every day like you. I came here to draw courage and strength from you; you're wonderful youth who stuck with the Land of Israel under difficult pioneering conditions and with great devotion, you continue the path of Caleb the son of Yefunah and Joshua the son of Nun."